If names such as Tommy Dorsey, Duke Ellington, Count Basie and Benny Goodman are your thing, then perhaps tonight's concert would have been a bit of a disappointment. Big Band it most certainly was, but brought right up to date and, I have to be honest, a little too extemporary and contemporary for me. The name Steve Berry was unfamiliar to me, but reading the programme I found that he is not only one of the professors at the RNCM but is also a performer, arranger and composer of some renown within the jazz world. And indeed the majority of the pieces played this evening were either written or arranged by him. The concert started with a clever ruse. There was no band, and looking a little worried and perplexed Berry walked out alone onto the stage saying he would just have to improvise until such a time as the band arrived. He picked up his double bass and started to vamp and improvise. In walked Katherine Brooke, RNCM student and vocalist, to sing Steve's arrangement of the Charlie Chaplin favourite, 'Smile'. One by one band members came on and started to play, and so by the end of this extended piece, all the band were together. This first piece also featured a solo saxophone riff by another RNCM tutor and usual conductor of the band, Mike Hall. What was interesting here though was that for the uninitiated one really had an excellent but very simple way of knowing what each instrument sounded like and how they blended in to the band as a whole. This Big Band comprised of a 5-piece rhythm section, piano, guitar, bass guitar, drum kit and percussion, whilst around the perimeter stood trombones, trumpets, saxophones, a clarinet and a flute. Unfortunately the programme did not list the music being played, and so the titles and such were mostly lost to me as I did not know or recognise any of the music after the opening Chaplin piece. What I can say though, is that these musicians were undoubtedly excellent. I had the good fortune to sit next to a young gentleman jazz saxophonist from Austria, and as we talked in the interval it was clear that his knowledge of this style of music was undeniable, he spoke animatedly and with great enthusiasm about this concert and how utterly excellent it was. 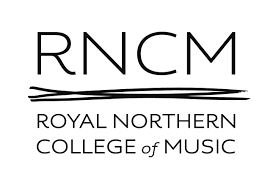 He had wandered in quite by chance, as he was over here on work and knew nothing of the band or the RNCM in general; but went away with his eyes wide open and his heart light. He had been transported to heaven in those two hours of the concert. I enjoyed watching Berry not conduct! I don't think I have ever seen anyone conduct like him before. Mostly he left the band to it, sitting on a stool at the side of the stage, or being preoccupied by picking up sheet music or altering mic positions, but was always there when needed to bring in or off and bring them back to strict tempos. It was fascinating just watching him! Musically, the band played modern arrangements and compositions which I am not in any way qualified to critique; but they all seemed to be enjoying themselves, smiling and bopping along to the beats. It was a joyous and uplifting concert and despite not particularly enjoying the music on offer, one couldn't help being swept up by the euphoria and enthusiasm. There was one piece, in the first half, I don't know the title but think Berry said it was called August One, which I actually did enjoy. It was different from all the rest, a completely different style with African rhythms, in a style which I believe is known as Township Jazz. I would have liked to have heard more in this genre. The second half started in the style of a New Orleans wake, with all the musicians parading and gathering ad hoc on the apron front whilst others marched down the auditorium steps. A fun idea and this worked really well. All too soon though it descended back into contemporary territory of which I was unfamiliar. My final verdict is this: for aficionados of the Big Band Modern Era, then you simply could not get better than this. And what is even more astounding is the fact that this band is composed entirely of students. Incredible!